The head of Homeland Security said Thursday that al Qaeda is rebuilding, but had no specific information the terror group was plotting a new attack on U.S. soil. "They continue to adapt and rebuild," Michael Chertoff told CBS's The Early Show. "The message, again, for us is we have to continue to be vigilant." Chertoff, however, added that security officials "don't have any specific information about an attack against the homeland in the near future." Chertoff's comments follow the latest threat assessment from U.S. counterterrorism analysts who say al Qaeda has used its safe haven along the Afghan-Pakistan border to restore its operating capabilities to a level unseen since the months before Sept. 11, 2001. A counterterrorism official familiar with a five-page summary of the document — titled "Al Qaeda better positioned to strike the West" — called it a stark appraisal. The analysis will be part of a broader meeting at the White House on Thursday about an upcoming National Intelligence Estimate. The findings suggest the network that launched the most devastating terror attack on U.S. soil has been able to regroup despite nearly six years of bombings, war and other tactics aimed at dismantling it. diverted to New York after the flight crew reported what they thought was a suspicious person on board. Officials have interviewed the person and sources told CBS News there is no connection to any terror plot. The threat assessment the White House will review focuses on the terror group's safe haven in Pakistan and makes a range of observations about the threat posed to the United States and its allies, officials said. Counterterrorism officials have been increasingly concerned about al Qaeda's recent operations. 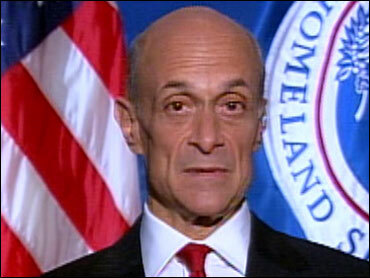 This week, Chertoff said he had a "gut feeling" that the United States faced a heightened risk of attack this summer. Asked to clarify the phrase, Chertoff told The Early Show his comments were based on "an informed opinion." The counterterrorism official, paraphrasing the report's conclusions, said Al Qaeda is "considerably operationally stronger than a year ago" and has "regrouped to an extent not seen since 2001. They are showing greater and greater ability to plan attacks in Europe and the United States." Kringen said he wouldn't attach a summer time frame to the concern. In studying the threat, he said he begins with the premise that al Qaeda would consider attacking the U.S. a "home run hit" and that the easiest way to get into the United States would be through Europe. "The No. 1 enemy in Iraq is al Qaeda," White House press secretary Tony Snow said Wednesday. "Al Qaeda continues to be the chief organizer of mayhem within Iraq." The report also notes that al Qaeda has increased its public statements, although analysts stressed that those video and audio messages aren't reliable indicators of the actions the group may take.